Canada's most powerful research supercomputer, Niagara, is now available to researchers of all disciplines across the country. Located at University of Toronto and supported by the university's high-performance computing division SciNet, the system is open to all Canadian university researchers. Niagara is part of a system of national advanced research computing infrastructure, which includes Cedar at Simon Fraser University, Arbutus at the University of Victoria, and Graham at University of Waterloo. Together, these systems provide Canadian researchers with the tools to compete globally using big data and high-performance computing systems. Advanced research computing is the backbone of Canadian innovation. Niagara will give researchers the computing power they need to study and find solutions to some of the world's biggest challenges. It will enable large-scale computation and simulation required for artificial intelligence, climate change research, ocean modelling, genomics, astrophysics, and other disciplines using big data research to fuel discovery. This new system is jointly funded by the Canada Foundation for Innovation, the Government of Ontario, and the University of Toronto. Niagara is the fastest computer system in the country and is able to run a single job across all 60,000 cores thanks to a high-performance network which interconnects all the nodes. Niagara is highly energy efficient and is configured specifically to accelerate innovation. The cluster is an end-to-end Lenovo solution with 1,500 ultra-dense ThinkSystem SD530 compute nodes, providing more than three petaflops of processing power, supported by 12 petabytes of storage. Mellanox EDR InfiniBand is used to create an industry-first Dragonfly+ network topology featuring adaptive routing to provide the high-speed low-latency communications necessary for large-scale full-system simulations. Burst-buffer technology from Excelero helps improve performance for data-intensive work loads. The system leverages Lenovo Ethernet for cluster management. For more facts about the system, please see below, or find more technical information here and here. Niagara is named after the iconic Niagara Falls; an Ontario landmark that symbolizes incredible power, discovery, and awe. 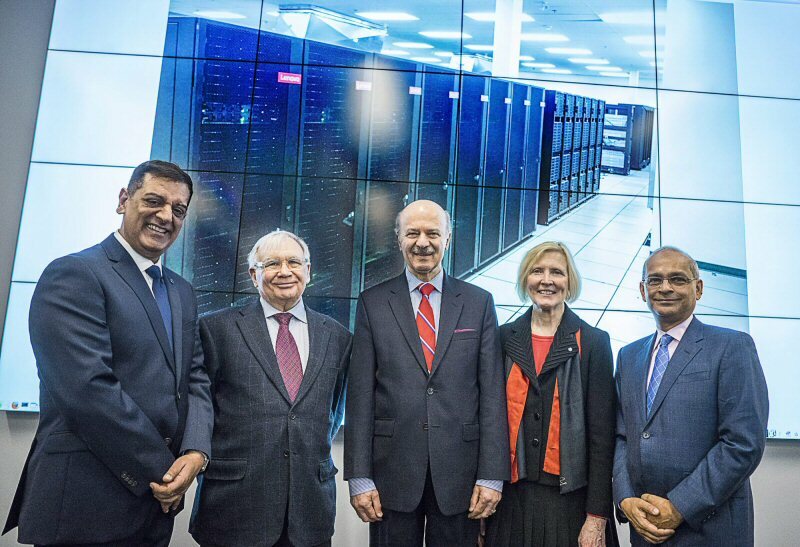 Please visit Compute Ontario website for quotes from Canadian academics using Niagara, quotes from other partners, and more about Canada's supercomputers.